Fidaxomicin (Fdx) is an antimicrobial RNA polymerase (RNAP) inhibitor highly effective against Mycobacterium tuberculosis RNAP in vitro, but clinical use of Fdx is limited to treating Clostridium difficile intestinal infections due to poor absorption. To identify the structural determinants of Fdx binding to RNAP, we determined the 3.4 Å cryo-electron microscopy structure of a complete M. tuberculosis RNAP holoenzyme in complex with Fdx. We find that the actinobacteria general transcription factor RbpA contacts fidaxomycin, explaining its strong effect on M. tuberculosis. Additional structures define conformational states of M. tuberculosis RNAP between the free apo-holoenzyme and the promoter-engaged open complex ready for transcription. The results establish that Fdx acts like a doorstop to jam the enzyme in an open state, preventing the motions necessary to secure promoter DNA in the active site. Our results provide a structural platform to guide development of anti-tuberculosis antimicrobials based on the Fdx binding pocket. Tuberculosis (TB) is an infectious disease that affects over ten million people every year. The Mycobacterium tuberculosis bacteria that cause the disease spread through the air from one person to another and mainly infect the lungs. Although curable, TB is difficult to eradicate because it is remarkably widespread, with one third of the world’s population estimated to carry the bacteria. Treatment for TB involves a mix of antibiotics that should be taken for several months to a year. The number of multidrug-resistant TB cases, where the infection is not treatable by the common cocktail of antibiotics, is rapidly increasing. There is therefore a need to discover new drugs that can kill the M. tuberculosis bacteria. An antibiotic called fidaxomicin is used to treat intestinal infections. Although it can kill Mycobacterium tuberculosis cells in culture, it is not absorbed from the intestines to the blood and thus cannot reach the lungs to kill the bacteria. It may be possible to change the structure of the drug so that it can enter the bloodstream. Before this can be done, researchers need to understand exactly how fidaxomicin kills the bacteria so that they know which parts of the drug they can alter without making it less effective. Fidaxomicin kills bacterial cells by binding to an enzyme called RNA polymerase. The antibiotic prevents the enzyme from reading and ‘transcribing’ DNA to form molecules that are essential for life. To learn more about how fidaxomicin has this effect, Boyaci, Chen et al. used cryo-electron microscopy to look at structures of the M. tuberculosis RNA polymerase in different states, including when it was bound to fidaxomicin. The structures reveal the chemical details of the interactions between the RNA polymerase and the antibiotic. The two molecules bind to each other through a region of the RNA polymerase that is unique to M. tuberculosis and closely related bacteria. Fidaxomicin acts like a doorstop to jam the RNA polymerase in an open state that cannot bind to DNA and transcribe genes. Medicinal chemists could now build on these findings to develop new drugs that might treat TB, either by modifying fidaxomicin or designing new antibiotics that bind to the same region of the RNA polymerase. Because the fidaxomicin-binding region of the RNA polymerase is specific to M. tuberculosis new antibiotics could be tailored towards the bacteria that have a minimal effect on a patient’s normal gut bacteria. The bacterial RNA polymerase (RNAP) is a proven target for antibiotics. The rifamycin (Rif) class of antibiotics, which inhibit RNAP function, is a lynchpin of modern tuberculosis (TB) treatment (Chakraborty and Rhee, 2015). TB, caused by the infectious agent Mycobacterium tuberculosis (Mtb), is responsible for almost 2 million deaths a year. It is estimated that one third of the world is infected. Mortality from TB is increasing, partly due to the emergence of strains resistant to Rifs (RifR) (Zumla et al., 2015). Hence, additional antibiotics against RifR Mtb are needed. Fidaxomicin (Fdx; also known as Dificimicin, lipiarmycin, OPT-80, PAR-101, or tiacumicin), an antimicrobial in clinical use against Clostridium difficile (Cdf) infection (Venugopal and Johnson, 2012), functions by inhibiting the bacterial RNAP (Talpaert et al., 1975). Fdx targets the RNAP 'switch region', a determinant for RNAP inhibition that is distinct from the Rif binding pocket (Srivastava et al., 2011), and Fdx does not exhibit cross-resistance with Rif (Gualtieri et al., 2009, 2006; Kurabachew et al., 2008; O'Neill et al., 2000). The switch region sits at the base of the mobile RNAP clamp domain and, like a hinge, controls motions of the clamp crucial for DNA loading into the RNAP active-site cleft and maintaining the melted DNA in the channel (Chakraborty et al., 2012; Feklistov et al., 2017). Fdx is a narrow spectrum antibiotic that inhibits Gram-positive anaerobes and mycobacteria (including Mtb) much more potently than Gram-negative bacteria (Kurabachew et al., 2008; Srivastava et al., 2011), but the clinical use of Fdx is limited to intestinal infections due to poor bioavailability (Venugopal and Johnson, 2012). Addressing this limitation requires understanding the structural and mechanistic basis for Fdx inhibition, which is heretofore unknown. Here, we used single-particle cryo-electron microscopy (cryo-EM) to determine structures of Mtb transcription initiation complexes in three distinct conformational states, including a complex with Fdx at an overall resolution of 3.4 Å. 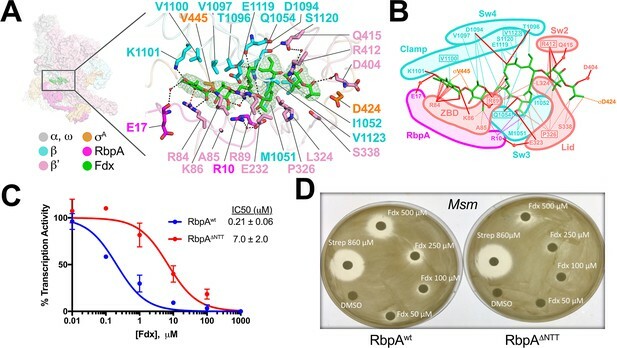 The results define the molecular interactions of Mtb RNAP with Fdx as well as the mechanistic basis of inhibition, and establish that RbpA, an Actinobacteria-specific general transcription factor (GTF), is crucial to the sensitivity of Mtb to Fdx. Fdx has potent inhibitory activity against multi-drug-resistant Mtb cells and the in vivo target is the RNAP (Kurabachew et al., 2008). To our knowledge, the in vitro activity of Fdx against mycobacterial RNAPs has not been reported. RbpA, essential in Mtb, is a component of transcription initiation complexes (TICs) that tightly binds the primary promoter specificity σA subunit of the RNAP holoenzyme (holo) (Bortoluzzi et al., 2013; Forti et al., 2011; Hubin et al., 2017a, 2015; Tabib-Salazar et al., 2013). We therefore compared Fdx inhibition of mycobacterial RNAPs containing core RNAP combined with σA (σA-holo) and RbpA with inhibition of Escherichia coli (Eco) σ70-holo using a quantitative abortive initiation assay (Davis et al., 2015). Fdx inhibited Mtb and M. smegmatis (Msm) transcription at sub-μM concentrations, whereas inhibition of an Mtb TIC containing Fdx-resistant (FdxR) RNAP (βQ1054H) (Kurabachew et al., 2008) required a nearly two orders of magnitude higher concentration of Fdx. Eco RNAP was inhibited even less effectively by another order of magnitude (Figure 1A, Figure 1—figure supplement 1A). Structure of an Mtb RbpA/TIC with Fdx at 3.4 Å resolution. (A) Fdx inhibits mycobacterial RbpA/σA-holo transcription greater than 250-fold more effectively than Ecoσ70-holo in in vitro abortive initiation assays. The error bars denote the standard error from a minimum of three experiments (for some points, the error bars are smaller than the width of the point and are not shown). (B) Chemical structure of Fdx (Serra et al., 2017). (C) Synthetic us-fork promoter fragment used for cryo-EM experiments. The DNA sequence is derived from the full con promoter (Gaal et al., 2001). The nontemplate-strand DNA (top strand) is colored light gray; the template-strand DNA (bottom strand), dark grey. The −35 and −10 elements are shaded yellow. The extended −10 (Keilty and Rosenberg, 1987) is colored violet. (D) The 3.4 Å resolution cryo-EM density map of the Fdx/RbpA/σA-holo/us-fork complex is rendered as a transparent surface colored as labeled. Superimposed is the final refined model; proteins are shown as a backbone ribbon, Fdx and the nucleic acids are shown in stick format. (E) Views of the cryo-EM map colored by local resolution based on blocres calculation (Cardone et al., 2013). The left view shows the entire map, while the middle view shows a cross-section of the map sliced at the level of the Fdx binding pocket. The boxed region is magnified on the right. Density for the Fdx molecule is outlined in red. We used single-particle cryo-EM to examine the complex of Mtb RbpA/σA-holo with and without Fdx (Figure 1B). Preliminary analyses revealed that the particles were prone to oligomerization, which was reduced upon addition of an upstream-fork (us-fork) junction promoter DNA fragment (Figure 1C). We sorted nearly 600,000 cryo-EM images of individual particles into two distinct classes, each arising from approximately half of the particles (Figure 1—figure supplement 2). The first class comprised Mtb RbpA/σA-holo with one us-fork promoter fragment and bound to Fdx. The cryo-EM density map was computed to a nominal resolution of 3.4 Å (Figure 1D, Figure 1—figure supplement 3, Supplementary file 1). The us-fork promoter fragment was bound outside the RNAP active site cleft, as expected, with the −35 and −10 promoter elements engaged with the σA4 and σA2 domains, respectively (Figure 1D). Local resolution calculations (Cardone et al., 2013) indicated that the central core of the structure, including the Fdx binding determinant and the bound Fdx, was determined to 2.9–3.4 Å resolution (Figure 1E). The second class comprised Mtb RbpA/σA-holo bound to two us-fork promoter fragments but without Fdx to a nominal resolution of 3.3 Å (Figure 2A, Figure 2—figure supplement 1, Supplementary file 1). One us-fork promoter fragment bound upstream from the RNAP active site cleft as in the previous class, but a second us-fork promoter fragment bound the RNAP downstream duplex DNA binding channel, with the 5-nucleotide 3'-overhang (Figure 1C) engaged with the RNAP active site (as the template strand) like previously characterized 3'-tailed templates (Gnatt et al., 2001; Kadesch and Chamberlin, 1982). Local resolution calculations (Cardone et al., 2013) indicated that the central core of the structure was determined to between 2.8–3.2 Å resolution (Figure 2B). The overall conformation of this protein complex and its engagement with the upstream and downstream DNA fragments was very similar to the crystal structure of a full Msm open promoter complex (RPo) (Hubin et al., 2017b) with one exception (see below). We will therefore call this complex an Mtb RbpA/RPo mimic. Structure of an Mtb RbpA/RPo mimic at 3.3 Å resolution. (A) The 3.3 Å resolution cryo-EM density map of the RbpA/σA-holo/(us-fork)2 complex (RbpA/RPo mimic) is rendered as a transparent surface colored as labeled. Superimposed is the final refined model; proteins are shown as a backbone ribbon, nucleic acids are shown in stick format. (B) Views of the Mtb RbpA/RPo mimic cryo-EM map colored by local resolution based on blocres calculation (Cardone et al., 2013). The left view shows the entire map, while the middle view shows a cross-section of the map sliced at the level of the RbpANTT. The boxed region is magnified on the right. Density for the RbpANTT is outlined in red. 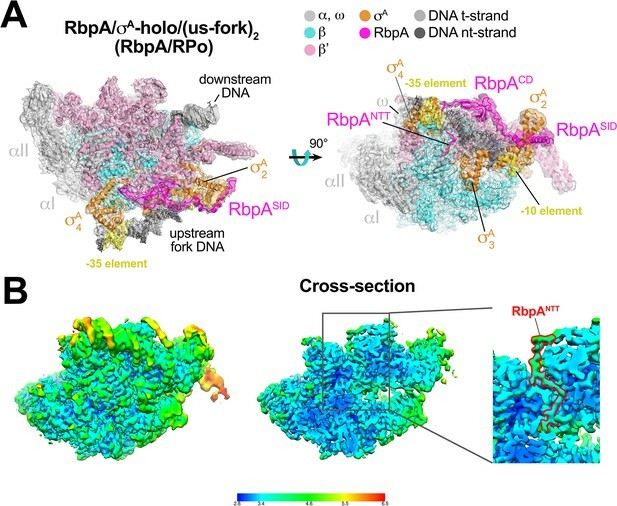 RbpA comprises four structural elements, the N-terminal tail (NTT), the core domain (CD), the basic linker, and the sigma interacting domain (SID) (Bortoluzzi et al., 2013; Hubin et al., 2017a; Tabib-Salazar et al., 2013). Our previous crystal structures of Msm TICs containing RbpA showed that the RbpASID interacts with the σA2 domain, the RbpABL establishes contacts with the promoter DNA phosphate backbone just upstream of the −10 element, and the RbpACD interacts with the RNAP β' Zinc-Binding-Domain (ZBD) (Hubin et al., 2017a, 2017b). Density for the RbpANTT (RbpA residues 1–25) was never observed in the crystal structures and was presumed to be disordered. In striking contrast to the crystal structures, both cryo-EM structures reveal density for the RbpANTT, which unexpectedly threads into the RNAP active site cleft between the ZBD and σA4 domains and snakes through a narrow channel towards the RNAP active site Mg2+ (Figure 3). On its path, conserved residues of the RbpANTT interact with conserved residues of the σ-finger (σ3.2-linker) on one wall of the channel, and with conserved residues of the ZBD and β'lid on the other wall (Figure 3C). The RbpANTT interacts with conserved structural elements in the RNAP active site cleft. (A) An overview of the RbpA/RPo structure is shown as a color-coded molecular surface (color-coding denoted in the key) except the β flap and σA4 domain are shown as backbone worms, revealing the RbpANTT (magenta) underneath. The DNA fragments are not shown. The boxed region is magnified in panel (B). (B) Magnified view of the boxed region from panel (A). The RbpANTT is shown in stick format with a transparent molecular surface. 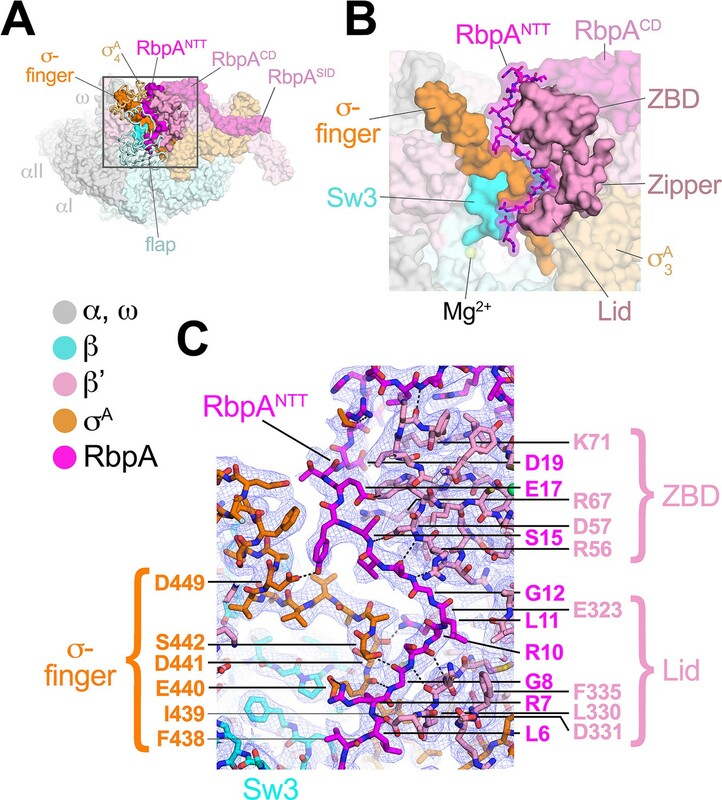 Conserved RNAP structural elements that interact with the RbpANTT are highlighted (βSw3, β'ZBD, β'Zipper, β'Lid, and σ-finger). (C) Further magnified view showing the cryo-EM density (blue mesh) with the superimposed model. Conserved residues of the RbpANTT are labeled, along with conserved residues of the β'ZBD, β'Lid, and σ-finger that interact with the RbpANTT. The most N-terminal RbpA residues visible in the cryo-EM structures (A2 in the Fdx complex, R4 in the RPo) sit near the tip of the σ-finger where it makes its closest approach to the RNAP active site, too far (25 Å) to play a direct role in RNAP catalytic activity or substrate binding. The σ-finger plays an indirect role in transcription initiation, stimulating de novo phosphodiester bond formation by helping to position the t-strand DNA (Kulbachinskiy and Mustaev, 2006; Zhang et al., 2012). The σ-finger is also a major determinant of abortive initiation, playing a direct role in initiation and promoter escape by physically blocking the path of the elongating RNA transcript before σ release (Cashel et al., 2003; Murakami et al., 2002). The intimate association of the RbpANTT with the σ-finger (Figure 3C) suggests that the RbpANTT also plays a role in these processes of Mtb RNAP initiation. This is consistent with our findings that the RbpANTT does not strongly affect RPo formation but plays a significant role in in vivo gene expression in Msm (Hubin et al., 2017a). This location of the RbpANTT explains the high Fdx sensitivity of Mtb RNAP (see below). The reconstruction from the Fdx-bound class (Figure 1D) reveals unambiguous density for Fdx (Figure 4A) and defines Fdx-interacting residues from four protein components of the complex, β, β', σA, and RbpA, including six water molecules, four of which mediate Fdx/RNAP interactions (Figure 4A,B). Fdx binding to the TIC buries a large accessible surface area of 4,800 Å2 (β, 2,100 Å2; β', 2,000 Å2; σA, 300 Å2; RbpA, 330 Å2). Fdx forms direct hydrogen bonds with nine residues (βQ1054, βD1094, βT1096, βK1101, β'R84, β'K86, β'R89, β'E323, and β'R412) and water-mediated interactions with four (β'R89, β'D404, β'Q415, and RbpA-E17). Notably, the Fdx/RNAP interaction is stabilized by two cation-π interactions between β'R84 and the aromatic ring of the Fdx homodichloroorsellinic acid moiety (Figure 1B) and β'R89 and the conjugated double-bond system centered between C4 and C5 of the macrolide core (Figures 1B and 4A,B). Fdx interacts with residues from eight distinct structural elements (Lane and Darst, 2010) of the initiation complex (βSw3, βSw4, β residues belonging to the clamp, β'ZBD, β'lid, β'Sw2, the σ-finger, and the RbpaNTT (Figure 4A,B). Structural basis for Fdx inhibition of Mtb transcription and the role of the RbpANTT. (A) (left) Overview of the Fdx/RbpA/σA-holo/us-fork structure, shown as a molecular surface (the DNA is not shown). The boxed region is magnified on the right. (right) Magnified view of the Fdx binding pocket at the same orientation as the boxed region on the left. Proteins are shown as α-carbon backbone worms. Residues that interact with Fdx are shown in stick format. Fdx is shown in stick format with green carbon atoms. Water molecules are shown as small pink spheres. Hydrogen-bonds are indicated by dashed gray lines. Cation-π interactions (between β'R84 and the aromatic ring of the Fdx homodichloroorsellinic acid moiety and β'R89 and the conjugated double-bond system centered between C4 and C5 of the macrolide core) are represented by red dashed lines. (B) Schematic summary of the Fdx contacts with σA-holo and RbpA. Fdx is shown in stick format with green carbon atoms. Thin dashed lines represent van der Waals contacts (≤4.5 Å), thick red lines represent hydrogen bonds (<4 Å). The thin dashed red lines denote cation-π interactions. (C) The RbpANTT is required for optimal inhibition of Mtb transcription by Fdx in in vitro abortive initiation assays. The error bars denote the standard error from a minimum of three experiments (for some points, the error bars are smaller than the width of the point and are not shown). (D) Zone of inhibition assays with Msm cells show that loss of the RbpA-NTT (RbpAΔNTT) leads to loss of Fdx sensitivity in vivo. Amino-acid substitutions conferring FdxR have been identified in RNAP β or β' subunits from Bacillus subtilis (Gualtieri et al., 2006), Cdf (Kuehne et al., 2017), Enterococcus faecalis (Gualtieri et al., 2009), and Mtb (Kurabachew et al., 2008), corresponding to Mtb RNAP β residues Q1054 (Sw3), V1100 and V1123 (clamp), and β' residues R89 (ZBD), P326 (lid), and R412 (Sw2). The structure shows that each of these residues makes direct interactions with Fdx (Figure 4A,B). All five chemical moieties of Fdx (Figure 1B) interact with at least one RNAP residue that confers FdxR when mutated (Figure 4B), suggesting that each moiety may be important for Fdx action. In addition to the β and β' subunits, Fdx interacts with residues of the σ-finger (D424 and V445; Figure 4A,B). Finally and unexpectedly, Fdx contacts residues from the RbpANTT (Figure 4A,B). To test the functional importance of the RpbANTT for Fdx inhibition in vitro, we compared Fdx inhibition of MtbσA-holo with either RbpA or RbpA with the NTT truncated (RbpAΔNTT) in the abortive initiation assay (Figure 1—figure supplement 1B). Truncation of the RbpA-NTT caused a 35-fold increase in resistance to Fdx (Figure 4C). RbpA is essential in Mtb and Msm, but strains carrying RbpAΔNTT are viable (Hubin et al., 2017a), allowing us to test the role of the RbpANTT in Fdx growth inhibition of Msm cells. We performed zone of inhibition assays on two Msm strains that are isogenic except one harbors wild-type RbpA (RbpAwt) and the other RbpAΔNTT (Hubin et al., 2017a). The Msm RbpA∆NTT strain grew considerably slower on plates, taking approximately twice the time as the wild-type Msm to reach confluency. Despite the growth defect, the RbpAΔNTT strain was significantly less sensitive to Fdx (Figure 4D). Discs soaked with up to 250 μM Fdx did not produce inhibition zones with RbpAΔNTT but inhibition zones were apparent with RbpAwt. At 500 μM Fdx, the inhibition zone for RbpAΔNTT was significantly smaller than for RbpAwt. By contrast, 860 μM streptomycin, a protein synthesis inhibitor, produced equal inhibition zones for the RbpAwt and RbpAΔNTT strains. We conclude that the essential role of RbpA in Mtb transcription is key to the relatively high sensitivity of Mtb cells to Fdx. The RNAP switch regions are thought to act as hinges connecting the mobile clamp domain to the rest of the RNAP (Gnatt et al., 2001; Lane and Darst, 2010). Bacterial RNAP inhibitors myxopyronin, corallopyronin, and ripostatin bind Sw1 and Sw2 and stabilize a closed-clamp conformation of the RNAP (Belogurov et al., 2009; Mukhopadhyay et al., 2008). The Fdx binding determinant does not overlap the sites for these other inhibitors, but the Fdx interactions with the Sw2, Sw3, and Sw4 regions (Figure 4A,B) suggest that Fdx may influence the clamp conformation as well. To understand the role of Fdx in clamp movement without the complication of DNA binding in the RNAP active site cleft, we determined cryo-EM structures of Mtb RbpA/σA-holo without DNA, with Fdx and without Fdx. Although the particles in the original cryo-EM datasets of Mtb RbpA/σA-holo were prone to oligomerization, we used 2D classification to isolate single particles and determined reconstructions of Mtb RbpA/σA-holo without DNA and with Fdx (overall 6.5 Å resolution from 21,000 particles, Figure 5A, Figure 5—figure supplement 1A–E) and without Fdx (overall 5.2 Å resolution from 88,000 particles; Figure 5A, Figure 5—figure supplement 1F–I). The cryo-EM density maps were of sufficient detail to visualize the bound antibiotic in the Fdx complex (Figure 5—figure supplement 1E) and to determine the domain organization (including the clamp conformation) by rigid-body refinement (Figure 5A). Thus, we were able to compare the RNAP conformational states from four solution complexes of the same RNAP in the absence of crystal packing forces (Figure 5B). Mechanism of Fdx inhibition of bacterial RNAP. (A) Cryo-EM density maps and superimposed refined models for Mtb RbpA/σA-holo (5.2 Å resolution) and Mtb Fdx/RbpA/σA-holo (6.5 Å resolution). (B) RNAP clamp conformational changes for four cryo-EM structures determined in this work. The RbpA/RPo (Figure 2A) structure was used as a reference to superimpose the other structures via α-carbon atoms of the structural core module (Supplementary file 2), revealing a common core RNAP structure (shown as a gray molecular surface) but with large shifts in the clamp modules. The clamp modules are shown as backbone cartoons with cylindrical helices and color-coded (blue, closed clamp of RPo; green, relaxed clamp of RbpA/σAholo; orange, open clamp of Fdx/RbpA/σA-holo/us-fork; red, open clamp of Fdx/RbpA/σA-holo). The clamp conformational changes can be characterized as rigid body rotations about a rotation axis perpendicular to the page (denoted). The angles of clamp opening for the different structures are shown (relative to the blue closed RPo clamp, 0° opening). (C) The core RNAP from the 3.4 Å resolution Fdx/RbpA/σA-holo/us-fork structure is shown as a gray molecular surface but with the open clamp colored orange. The structure is sliced at the level of the Fdx binding pocket (the bound Fdx is shown in green). The boxed region is magnified below, showing the tight fit of the Fdx molecule in a narrow gap between the clamp and the rest of the RNAP. (D) The core RNAP from the 3.3 Å resolution RbpA/RPo structure is shown as a gray molecular surface but with the closed clamp colored blue. The structure is sliced at the level of the (empty) Fdx binding pocket. Fdx, modeled from the structure shown in (C), is shown in green. The boxed region is magnified below. Fdx cannot bind to RNAP with a closed clamp because clamp closure pinches off the Fdx binding site. Clamp closure is required for initiation and stabilization of the transcription bubble (Feklistov et al., 2017) and also for stable binding of nucleic acids in the RNAP cleft. The four structures were superimposed by the structural core module (Supplementary file 2), comprising the ω subunit and highly conserved β and β′ regions in or near the active center that have not been observed to undergo significant conformational changes in dozens of RNAP structures. Using the RPo structure (Figure 2A) as a reference, the structures superimposed with rmsds < 0.4 Å over at least 898 aligned α-carbon (Cα) atoms of the structural core module, but rmsds > 9 Å for 461 Cα-atoms of the clamp modules (Supplementary file 2), indicating large shifts of the clamp module with respect to the rest of the RNAP in the different complexes. Alignment of the structures revealed that the clamp conformational changes could be characterized as rigid body rotations about a common rotation axis (Figure 5B). Assigning a clamp rotation angle of 0° (closed clamp) to the RPo structure (blue, Figure 5B), the RbpA/σA-holo clamp is rotated open by about 12° (green, Figure 5B). Because this complex is not interacting with any other ligands that might be expected to alter the clamp conformation (such as Fdx or DNA), we will refer to this as the 'relaxed' clamp conformation. The two Fdx-bound complexes, with or without us-fork DNA, show further opening of the clamp (14° and 15°, respectively; orange and red in Figure 5B). In the high-resolution Fdx/TIC structure (Figure 1D), Fdx binds in a narrow gap between the open clamp module and the rest of the RNAP (Figure 5C). 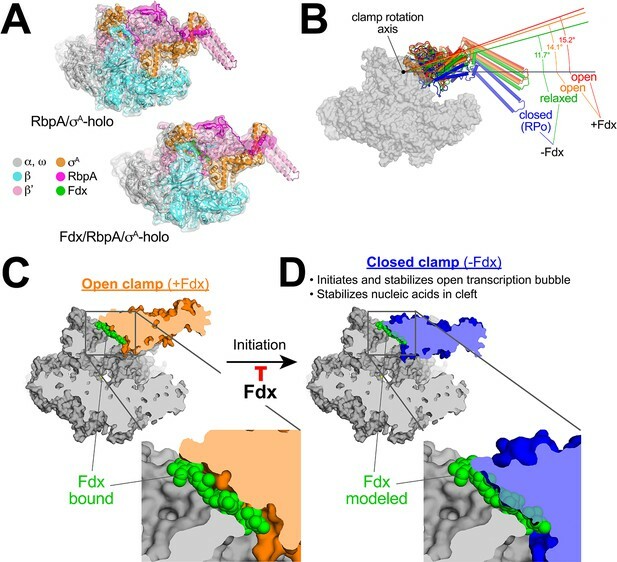 Examination of the high-resolution RPo (closed clamp) structure reveals that clamp closure pinches off the Fdx binding pocket (Figure 5D) - Fdx can only bind to the open-clamp conformation of RNAP. We thus conclude that Fdx acts like a doorstop, binding and stabilizing the open-clamp conformation. Clamp dynamics play multiple important roles in the transcription cycle. Motions of the clamp module and the role of the switch regions as hinges were first noted by comparing crystal structures of free RNAPs (Cramer et al., 2001; Zhang et al., 1999) with the crystal structure of an elongation complex containing template DNA and RNA transcript (Gnatt et al., 2001). Binding of the downstream duplex DNA and RNA/DNA hybrid in the RNAP active-site cleft was proposed to close the clamp around the nucleic acids, explaining the high processivity of the transcription elongation complex. Numerous subsequent crystal structures have supported the idea that stable, transcription-competent complexes of RNAP with nucleic acids, either RPo (Bae et al., 2015; Hubin et al., 2017b; Zuo and Steitz, 2015) or elongation complexes (Gnatt et al., 2001; Kettenberger et al., 2004; Vassylyev et al., 2007), correlate with the closed-clamp conformation. Effects of crystal packing forces on clamp conformation, however, cannot always be ruled out. Observations of clamp positions by solution FRET (Chakraborty et al., 2012), and more recently in cryo-EM structures (Bernecky et al., 2016; Hoffmann et al., 2015; Kang et al., 2017; Neyer et al., 2016) (in the absence of crystal packing forces) have confirmed the relationship between clamp closure and stable nucleic-acid complexes. Clamp motions have also been shown to play a critical role in the process of promoter melting to form the transcription bubble during RPo formation (Feklistov et al., 2017). Thus, the trapping of an open-clamp RNAP conformation by Fdx in unrestrained cryo-EM conditions (Figure 5C) suggests that Fdx inhibits transcription initiation by preventing clamp motions required for RPo formation, or by not allowing RNAP to form stable transcription-competent complexes with nucleic acids, or both (Figure 5C,D). These results are broadly consistent with mechanistic analyses of (Tupin et al., 2010) and (Morichaud et al., 2016) showing that Fdx blocks promoter melting at an early step but providing RNAP a pre-melted template overcomes the block. These authors proposed that Fdx likely prevented the clamp from closing, again consistent with our structural findings. Our results establish the molecular details of Fdx interactions with the bacterial RNAP (Figure 4A,B) and a mechanism of action for Fdx (Figure 5C,D). Crucially, the essential actinobacterial GTF RbpA is responsible for the high sensitivity of mycobacterial RNAP to Fdx both in vitro (Figure 4C) and in vivo (Figure 4D). This new knowledge provides a structural platform for the development of antimicrobials that target the Fdx binding determinant and underscores the need to define structure-activity relationships of drug leads using near-native states, in this case using cryo-EM with the RbpA/σA-holo complex to guide development of effective Mtb treatments. DNA reagent pMP55 this paper pAC22 derivative encoding Mtb RNAP with β S450Y. Derived from pAC22 by P69R substitution, removal of the N-terminal β insertion, and substitutions of increased predicted-strength RBSs for the rpoA, rpoZ, and rpoB::C RBSs. DNA reagent pMP57 this paper pMP55 with β Q1054H. Fdx resistant. DNA reagent pMP61 this paper pMP55 with wild-type S450 in place of β Y450. DNA reagent pMP62 this paper pMP61 with β S450L. Mtb RNAP overexpression plasmid. The overexpression plasmid (OEP) for Mtb RNAP was engineered from an existing OEP for M. bovis RNAP (Czyz et al., 2014), pAC22. Four modifications were made. First, a sequence in pAC22 that encodes an N-terminal 6-aa insertion at codon 2 of rpoB was removed. Second, a sequence upstream of rpoZ that included an ATG that potentially allowed an N-terminal extension on ω was removed. Third, to increase protein expression, the ribosome-binding sites (RBSs) for rpoA, rpoZ, and rpoB::C were re-engineered to encode stronger predicted RBSs using predicted translation initiation rates calculated using the Salis RBS strength calculator (https://salislab.net/software/) (Espah Borujeni et al., 2014). Finally, the single amino-acid difference between Mtb RNAP and Mbo RNAP at position 69 of β was changed from Pro (Mbo) to Arg (Mtb) (P69R). The resulting plasmid, pMP55, encodes β S450Y (RifR) Mtb RNAP. A wild-type derivative (RifS) was engineered by site-direct mutagenesis to give plasmid pMP61 that expresses the wild-type Mtb RNAP. A derivative of pMP55 encoding the β Q1054H substitution that confers resistance to Fidaxomicin (Fdx) (Kurabachew et al., 2008) was constructed by site-directed mutagenesis. Samples for Cryo-EM grid preparation used Mtb His-tagged-σA and RbpA co-expressed and purified as previously described (Hubin et al., 2015; 2017a). To compare Fdx sensitivity of full-length RbpA and RbpAΔNTT, these proteins, and Mtb His-tagged-σA were expressed separately and purified as described previously (Hubin et al., 2015; 2017a). Briefly, Rosetta-2 cells (EMD-Millipore/Novagen) were co-transformed with pET plasmids expressing Mtb σA(His-tagged) and RbpA and induced with 0.5 mM IPTG at 30°C for 4 hr. Clarified lysates was subjected to Ni2+ affinity, removal of the His-tag, a second Ni2+ affinity (collecting the flow through this time) and size exclusion chromatography. Mtb RNAP was expressed and purified as previously described for Mbo and Msm RNAPs (Davis et al., 2015; Hubin et al., 2017a). Eco core RNAP, Eco σ70, Msm σA, Msm RbpA, and Msm core RNAP were expressed and purified as described (Davis et al., 2015; Hubin et al., 2015; 2017a). In vitro abortive initiation transcription assays were performed using the WT AP3 (−87 to +71) promoter at 37°C as described (Davis et al., 2015): Assays were performed in KCl assay buffer (10 mM Tris-HCl, pH 8.0, 50 mM KCl, 10 mM MgCl2, 0.1 mM EDTA, 0.1 mM DTT, 50 μg-/mL BSA). The IC50's of Fdx on the different holos were calculated as follows: Mtb and Msm RNAP holo were incubated with the cognate σA and RbpA-FL or RbpA∆NTT, and Eco RNAP (50 nM) was incubated with σ70, to form holos. Holos were incubated with Fdx for 10 min at 37°C prior to addition of template DNA. DNA template was added (10 nM final) and the samples were incubated for 15 min at 37°C for open complex formation. Transcription was initiated with nucleotide mix, and stopped with a 2X Stop buffer (45 mM Tris-HCl, 45 mM Boric acid, 8 M Urea, 30 mM EDTA, 0.05% bromophenol blue, 0.05% xylene cyanol) after 10 min at 37°C. Transcription products were denatured by heating at 95°C for two minutes and visualized by polyacrylamide gel electrophoresis using phosphorimagery and quantified using ImageJ (Schneider et al., 2012). Msm strains MGM6232 (ΔrbpA attB::rbpA kan) and MGM6234 (ΔrbpA attB::rbpA(28-114) kan) (Hubin et al., 2017a) were grown overnight in LBsmeg (LB with 0.5% glycerol, 0.5% dextrose and 0.05% Tween80) and 2 mL were centrifuged and resuspended in 200 µL of residual media and then plated. Filter discs were placed on the plates and stock solutions of Fdx were prepared in 10% DMSO at different concentrations (50 μM, 100 μM, 250 μM and 500 μM). 10 μl of antibiotic from each stock solution was pipetted onto the disks. Streptomycin (0.5 mg/ml, 860 μM) and 10% DMSO were used as positive and negative controls, respectively. Plates were incubated at 37°C for 74 hr and the zone of inhibition around each disk was photographed and measured. Mtb RbpA/σA-holo (0.5 ml of 5 mg/ml) was injected into a Superose 6 Increase column (GE Healthcare Life Sciences, Pittsburgh, PA) equilibrated with 20 mM Tris-HCl pH 8.0, 150 mM K-Glutamate, 5 mM MgCl2, 2.5 mM DTT. The peak fractions of the eluted protein were concentrated by centrifugal filtration (EMD-Millipore, Darmstadt, Germany) to 6 mg/mL protein concentration. Fdx (when used) was added at 100 μM and us-fork DNA (when used) was added to 20 μM. The samples were incubated on ice for 15 min and then 3-([3-cholamidopropyl]dimethylammonio)−2-hydroxy-1-propanesulfonate (CHAPSO) was added to the sample for a final concentration of 8 mM prior to grid preparation. C-flat CF-1.2/1.3-4Au 400 mesh gold grids (Protochips, Morrisville, NC) were glow-discharged for 20 s prior to the application of 3.5 μl of the sample (4.0–6.0 mg/ml protein concentration). After blotting for 3–4.5 s, the grids were plunge-frozen in liquid ethane using an FEI Vitrobot Mark IV (FEI, Hillsboro, OR) with 100% chamber humidity at 22°C. Structural biology software was accessed through the SBGrid consortium (Morin et al., 2013). Fdx/RbpA/σA-holo/us-fork. The grids were imaged using a 300 keV Titan Krios (FEI) equipped with a K2 Summit direct electron detector (Gatan, Warrendale, PA). Images were recorded with Leginon (Nicholson et al., 2010) in counting mode with a pixel size of 1.1 Å and a defocus range of 0.8 μm to 1.8 μm. Data were collected with a dose of 8 electrons/px/s. Images were recorded over a 10 s exposure with 0.2 s frames (50 total frames) to give a total dose of 66 electrons/Å2. Dose-fractionated subframes were aligned and summed using MotionCor2 (Zheng et al., 2017) and subsequent dose-weighting was applied to each image. The contrast transfer function was estimated for each summed image using Gctf (Zhang, 2016). From the summed images, Gautomatch (developed by K. Zhang, MRC Laboratory of Molecular Biology, Cambridge, UK, http://www.mrc-lmb.cam.ac.uk/kzhang/Gautomatch) was used to pick particles with an auto-generated template. Autopicked particles were manually inspected, then subjected to 2D classification in cryoSPARC (Punjani et al., 2017) specifying 50 classes. Poorly populated and dimer classes were removed, resulting in a dataset of 582,169 particles. A subset of the dataset was used to generate an initial model of the complex in cryoSPARC (ab-initio reconstruction). Using the ab-initio model (low-pass filtered to 30 Å-resolution), particles were 3D classified into two classes using cryoSPARC heterogenous refinement. CryoSPARC homogenous refinement was performed for each class using the class map and corresponding particles, yielding two structures with different clamp conformations: open (Fdx/RbpA/σA-holo/us-fork; Figure 1D) and closed [RbpA/σA-holo/(us-fork)2; Figure 2A]. Two rounds of heterogenous/homogeneous refinements were performed for each class to achieve the highest resolution. The open class (Fdx/RbpA/σA-holo/us-fork) contained 173,509 particles with an overall resolution of 3.38 Å (Figure 1—figure supplement 3A) while the closed class [Mtb RNAP/σA/RbpA/(us-fork)2] contained 171,547 paricles with a overall resolution of 3.27 Å (Figure 2—figure supplement 1A). Particle orientations of each class were plotted in cryoSPARC (Figure 1—figure supplement 1C, Figure 2—figure supplement 1C). FSC calculations (Figure 1—figure supplement 1A, Figure 2—figure supplement 1A) were performed in cryoSPARC and the half-map FSC (Figure 1—figure supplement 1B, Figure 2—figure supplement 1B) was calculated using EMAN2 (Tang et al., 2007). Local resolution calculations (Figures 1E and 2B) were performed using blocres (Cardone et al., 2013). Mtb RbpA/σA-holo. The grids were imaged using a 200 keV Talos Arctica (FEI) equipped with a K2 Summit direct electron detector (Gatan). Images were recorded with Serial EM (Mastronarde, 2005) in super-resolution counting mode with a super-resolution pixel size of 0.75 Å and a defocus range of 0.8 μm to 2.4 μm. Data were collected with a dose of 8 electrons/px/s. Images were recorded over a 15 s exposure using 0.3 s subframes (50 total frames) to give a total dose of 53 electrons/Å2. Dose-fractionated subframes were 2 × 2 binned (giving a pixel size of 1.5 Å), aligned and summed using Unblur (Grant and Grigorieff, 2015). The contrast transfer function was estimated for each summed image using Gctf (Zhang, 2016). From the summed images, Gautomatch (developed by K. Zhang, MRC Laboratory of Molecular Biology, Cambridge, UK, http://www.mrc-lmb.cam.ac.uk/kzhang/Gautomatch) was used to pick particles with an auto-generated template. Autopicked particles were manually inspected, then subjected to 2D classification in RELION (Scheres, 2012) specifying 100 classes. Poorly populated classes were removed, resulting in a dataset of 289,154 particles. These particles were individually aligned across movie frames and dose-weighted using direct-detector-align_lmbfgs software to generate ‘polished’ particles (Rubinstein and Brubaker, 2015). A subset of the dataset was used to generate an initial model of the complex in cryoSPARC (ab-initio reconstruction). ‘Polished’ particles were 3D auto-refined in RELION using this ab-initio 3D template (low-pass filtered to 60 Å-resolution). RELION 3D classification into two classes was performed on the particles using the refined map and alignment angles. Among the 3D classes, the best-resolved class, containing 87,657 particles, was 3D auto-refined and post-processed in RELION. The overall resolution of this class was 6.9 Å (before post-processing) and 5.2 Å (after post-processing). Subsequent 3D classification did not improve resolution of this class. Fdx/RbpA/σA-holo. The same procedure as described above for Mtb RbpA/σA-holo was used. After RELION 2D classification, poorly populated classes were removed, resulting in a dataset of 63,839 particles. In the end, the best-resolved 3D class, containing 21,115 particles, was 3D auto-refined and post-processed in RELION. The overall resolution of this class was 8.1 Å (before post-processing) and 6.5 Å (after post-processing). To build initial models of the protein components of the complex, Msm RbpA/σA-holo/us-fork structure (PDB ID 5TWI) (Hubin et al., 2017a) was manually fit into the cryo-EM density maps using Chimera (Pettersen et al., 2004) and real-space refined using Phenix (Adams et al., 2010). In the real-space refinement, domains of RNAP were rigid-body refined. For the high-resolution structures, the rigid-body refined models were subsequently refined with secondary structure restraints. A model of Fdx was generated from a crystal structure (Serra et al., 2017), edited in Phenix REEL, and refined into the cryo-EM density. Refined models were inspected and modified in Coot (Emsley and Cowtan, 2004) according to cryo-EM maps, followed by further real-space refinement with PHENIX. Journal of Biological Chemistry 278:5539–5547. International Journal of Antimicrobial Agents 34:605–606. Antimicrobial Agents and Chemotherapy 50:401–402. The Journal of Biological Chemistry 257:5286–5295. Journal of Antimicrobial Chemotherapy, 10.1093/jac/dkx486, 29253242. Journal of Biological Chemistry 281:18273–18276. Journal of Antimicrobial Chemotherapy 62:713–719. Journal of Molecular Biology 428:463–476. Journal of Structural Biology 172:395–399. Antimicrobial Agents and Chemotherapy 44:3163–3166. Current Opinion in Microbiology 14:532–543. Biochemical and Biophysical Research Communications 63:328–334. The Lancet Global Health 3:e10–e12. Thank you for submitting your article "Fidaxomicin jams M. tuberculosis RNA polymerase motions needed for initiation via RbpA contacts" for consideration by eLife. Your article has been reviewed by three peer reviewers, and the evaluation has been overseen by Gisela Storz as the Reviewing and Senior Editor. The following individuals involved in review of your submission have agreed to reveal their identity: William R Jacobs (Reviewer #1); Yuan He (Reviewer #2); Dong Wang (Reviewer #3). A critical challenge for tuberculosis (TB) treatment and other antimicrobial clinical practice is to develop novel antibiotics that can outcompete increasing drug resistance. Inhibition of bacteria RNA polymerase (RNAP) transcription and subsequent bacteria growth is a proven effective therapeutic strategy. Fidaxomicin (Fdx) is a narrow spectrum antibiotic that target Gram-positive anaerobes and mycobacteria (including Mtb) RNA polymerase (RNAP). In this work, Campbell and colleagues build on previous studies reporting the first CryoEM structures of a complete M. tuberculosis RNAP holoenzyme in complex with Fdx at 3.4 A resolution. 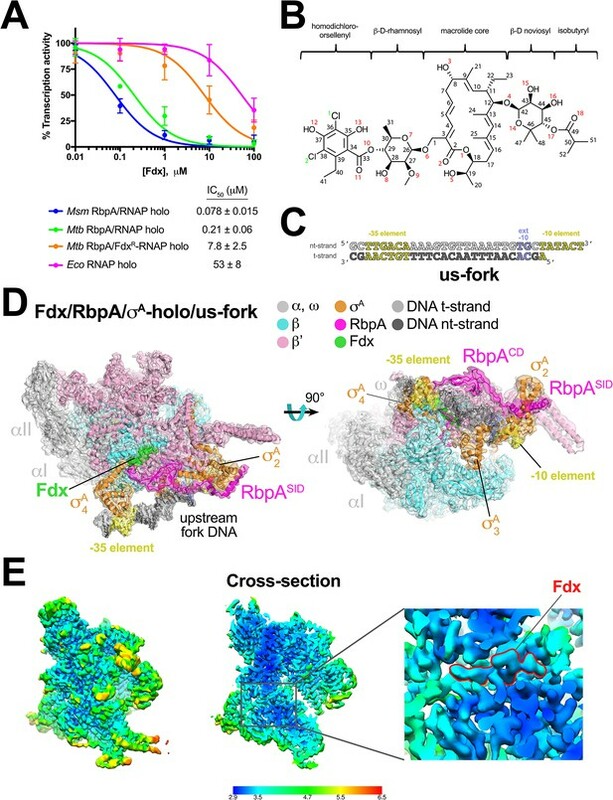 In fact, the authors reported a total of four cryoEM structures: Two fdx bound Mtb /RbpA/σA-holo complexes (with or without us-fork promoter DNA) and two fdx absence RbpA/σA -holo complexes (with or without us-fork promoter DNA). By comparing the different RNAP conformational states from four solution complexes of the same RNAP, authors are able to obtain several important structural insights into mechanism of action of Fdx. Overall the reviewers were in agreement that this paper summarizes an impressive amount of work and is easy to read. The reviewers had a limited number of suggestions that should be addressed in a revised version. 1) Expand the discussion to suggest how understanding of the structure could apply to improving the poor bioactivity and the use of this drug to treat M. tuberculosis infections. 2) The paper by Tupin et al., 2010, presented a nice and detailed mechanistic investigation of the inhibition of bacterial RNA polymerase by Lpm (Fdx). This is study should be cited and discussed. 3) The section titled "The RbpANTT is critical for Fdx potency against Mtb RNAP in vitro and in vivo" is misleading since M. smegmatis was used for the growth inhibition assay. While M. smegmatis is a model organism to study M. tuberculosis, it is not M. tuberculosis. Suggest using M. tuberculosis safe strains to test the growth inhibition of M. tuberculosis by Fdx or avoid this direct implication. The structural results define the details of a binding determinant in the RNAP that facilitates the discovery of other inhibitors (including Fdx derivatives) that have activity and might have better bioavailability. Because we now know which atoms of Fdx interact with the protein, one can now make educated guesses on which chemical groups to modify. It is beyond the scope of our expertise to say what changes can be made but we propose the structure can now be used to guide modification or screens. We have made some edits to change the ‘tone’ of our manuscript with this in mind. Changes have been made to the Abstract, Introduction, and Summary section. 2) The paper by Tupin et al., EMBO J (2010) 29, 2527-2537, presented a nice and detailed mechanistic investigation of the inhibition of bacterial RNA polymerase by Lpm (Fdx). This is study should be cited and discussed. We thank the reviewers for pointing out this oversight. We have added a sentence pointing out how the mechanistic analyses of Fdx action from the Brodolin group (actually in two papers, Tupin et al., 2010 and Morichaud et al., 2016) are broadly consistent with our conclusions (subsection “Fdx inhibits RNAP by trapping an open-clamp conformation” last sentence). This was an oversight; we thank the reviewers for catching it. The section title has been changed to ‘The RbpANTT is critical for Fdx potency against mycobacterial RNAP in vitroand in vivo’. We thank K Uryu at The Rockefeller University Electron Microscopy Resource Center for help with EM sample preparation, M Ebrahim and J Sotiris at The Rockefeller University Cryo-EM Resource Center and LY Kim, M Kopylov, and E Eng at the New York Structural Biology Center for help with data collection, and members of our research groups for helpful comments on the manuscript. Some of the work presented here was conducted at the Simons Electron Microscopy Center and the National Resource for Automated Molecular Microscopy located at the New York Structural Biology Center, supported by grants from the NIH National Institute of General Medical Sciences (GM103310), NYSTAR, and the Simons Foundation (349247). HB was supported by a Women and Science Postdoctoral Fellowship from The Rockefeller University. This work was supported by NIH grants R01 GM38660 to RL, R35 GM118130 to SAD, and R01 GM114450 to EAC. © 2018, Boyaci et al.